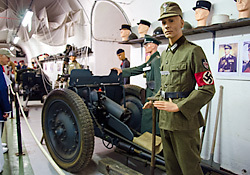 The Maginot Line Museum is located outside the town of Veckring, France, along the northeastern border with Germany. The start of the tour Ouvrage Hackenberg (translates to Hackenberg Works, or Hackenberg Fortifications in English) was visiting the entrance area with its massive blast doors, retractable floor, and small gift shop. 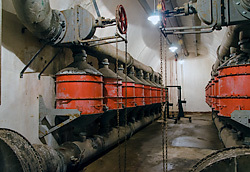 Further in we toured the rooms with the ventilation blowers and poison gas filters, and power generation room. 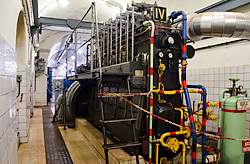 I understand for some tours they start one of the diesel generators for the tour, but the person who normally does that was not on hand. 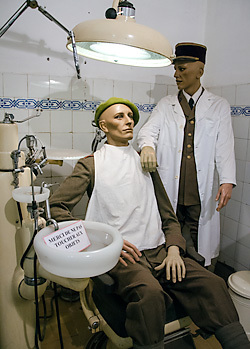 Continuing on we toured the crew's quarters, galley, medical facilities, and wine distillery. 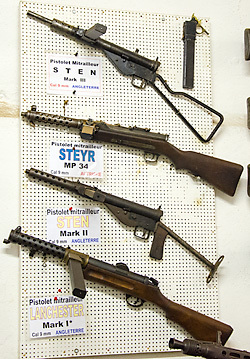 There was also a long corridor with a good selection of small arms and period uniforms on display. Next was my favorite part, the train ride through the mountain from bunker to bunker on the restored electrified rail system within the Maginot Line fortifications. The ride was over 5 minutes and covered about a mile and a half of railway through the underground tunnels. It really was a blast! At the far end we departed the train and took the restored elevator up to Blocks 8 and 9 and I think 10. 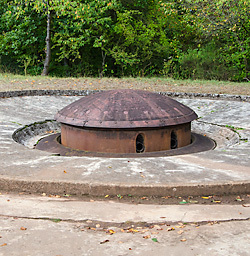 One of the 135mm Heavy Mortar turrets in Block 9 had been restored and the guides demonstrated how it could be raised and lowered and traversed under power. Next we went outside and walked up the hill to view the outside of that turret and one of the guides inside raised the turret, swiveled it around, and lowered it back down for us. It was pretty neat. After the demonstration was complete we went back inside and walked through the tunnels to the bunkers of Block 8. There, one of the 135mm Heavy Casement Mortars had been restored and the guide showed us how the breech worked and demonstrated the power traverse and elevation operation of the gun. We then walked outside to see the damage from American tank destroyers in 1944 when they re took it from the occupying German forces. 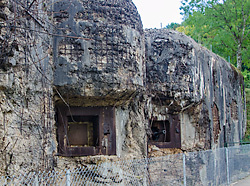 When the American troops approached the fortifications, one of the locals showed them an area where they could fire on the Block 8 Maginot Line pillboxes without being in the line of fire from the fort. The Americans drove their M12 155mm self propelled guns up to that spot and began hammering away at the side of the gun emplacements at point blank range until the concrete was blasted away enough for troops to enter. 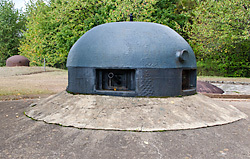 The German troops retreated back into the tunnels and set off the munitions in the magazine, bending the large blast door near the Munitions Entrance. The damage has been filled in with fresh concrete, and there is a lot of it. We returned to the bunker and rode the elevator back down to the railway for another underground train ride through the mountain back to the entrance to the Maginot Line Museum. I've been to a lot of WWII military museums in the US but other than some ships that had seen combat none had direct links to actual battles. To visit a location where the fighting actually took place was an amazing experience. 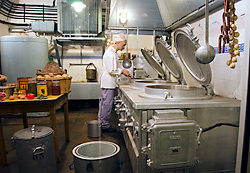 I would definitely recommend visiting Ouvrage Hackenberg, even if you have to add an extra day to your trip, as we did. I apologise for the quality of some of the images. I usually allow a full day for photographs but with this museum it is a structured tour and I had to do everything on the run and there was little time to compose or check image results. 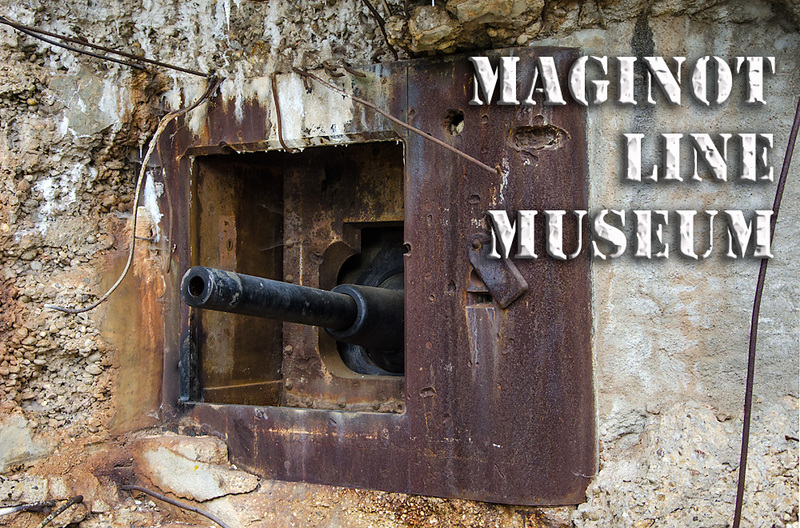 Visit the Maginot Line Museum's Website for hours and more information. There is no food in walking distance from the museum, but there are restaurants in the nearby town of Veckring.